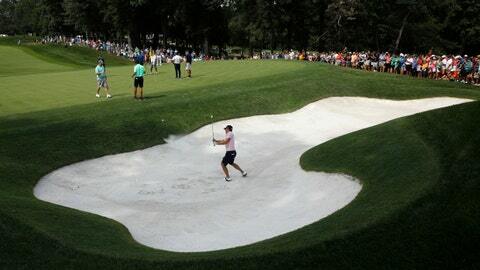 Justin Thomas hits out of a bunker on the 15th hole during a practice round for the PGA Championship at Bellerive Country Club on Wednesday. The World Golf Championship event in 2001 was canceled after the Sept. 11 terrorist attacks, the first PGA Tour event to be canceled in its entirety in more than 50 years. Heavy rains have washed out tournament play other years, unheralded winners have left galleries less than enthused, and some of the biggest names in the game — Tiger Woods, for example — have missed Bellerive because of injuries. As if on cue, a white picket fence near the 18th green broke under the weight of fans pressing for autographs, sending several sprawling to the ground. Nobody was seriously hurt. Then, a line of wicked storms rolled through Tuesday, soaking the course and wiping out many practice rounds. He had come to town early in 2001 to conduct a clinic for American Express, the sponsors of the WGC event, and he was in the locker room at Bellerive when the planes hit the World Trade Center. He watched the TVs with mouth agape until he couldn’t stomach it anymore, finally heading to the course. He played nine holes of a practice round with Mark Calcavecchia while Woods’ head of security, Joe Corless, provided them with a constant stream of updates. Many fans who bought tickets that week waited patiently for another chance to see Woods, and they thought it would happen at the BMW Championship in 2008. But two days after beating Rocco Mediate in a playoff at the U.S. Open, Woods announced he would be having season-ending knee surgery.